Looking for a way to relax and unwind from a stressful day or week? When your bathroom design includes an AquaGlow™ Floating Light Garden™, you can soak away your stresses in your tub to the soft glow of these beautiful, decorative floral lights. 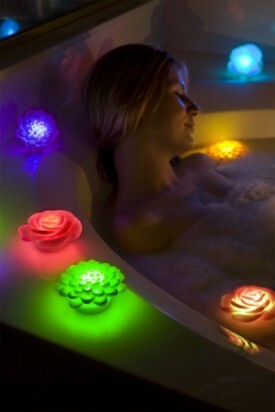 Each AquaGlow™ Floating Light Garden set includes three decorative flower lights: a rose, a daisy, and a lotus flower. If you want to surround yourself with glowing floral lights, you can add several sets to your bathroom decor. Whether your bathroom features three or twelve AquaGlow lights, you're sure to enjoy the relaxing effects of these beautiful lighting features. Each light creates four different lighting effects, offering a warm bouquet of glowing colors. When you add a Floating Light Garden to your bathroom décor, you can sit back and watch a dazzling display of color while you relax, unwind, and rejuvenate your body and mind. The lights will change from vibrant red to gorgeous green and fade into a stunning blue, and more. An AquaGlow™ Floating Light Garden™ can add romantic illumination and charm to a variety of different settings, and they're perfect for use in the bathroom. Ideal for use in or around your bathtub, you can also illuminate your swimming pool or hot tub with these beautiful decorative lighting accessories. These LED lights are easy and safe to operate. They are battery operated and include a one hour automatic shut-off feature. For more information about the AquaGlow™ Floating Light Garden™, and to see the latest aquatic lighting products from the GAME group, see www.Game-Group.com.